Ozone is a proven tool to reduce the spread of mold and mold spores. When used over a long period of time, mold will be destroyed using ozone. Grain damaged by moisture, and potentially, mold can be treated with ozone to allow this grain to be sold. As there may be damage from mold that cannot be reversed, ozone use for this application should be evaluated carefully to ensure the benefits will still outweigh the costs. Ozone gas is produced via an ozone generation system. This ozone gas is pumped into the grain bin and diluted with existing air flow to treat the grain. Ozone treatment may be necessary over the course of days or even weeks depending upon your specific application. Ozone equipment is available in trailers that can be set near the grain bin for the duration of the required ozone treatment. Ozone monitors can measure, and verify ozone levels leaving the grain bin to ensure ozone gas has passed through the entire grain bin and a residual of ozone is present. This will verify operation of the system. 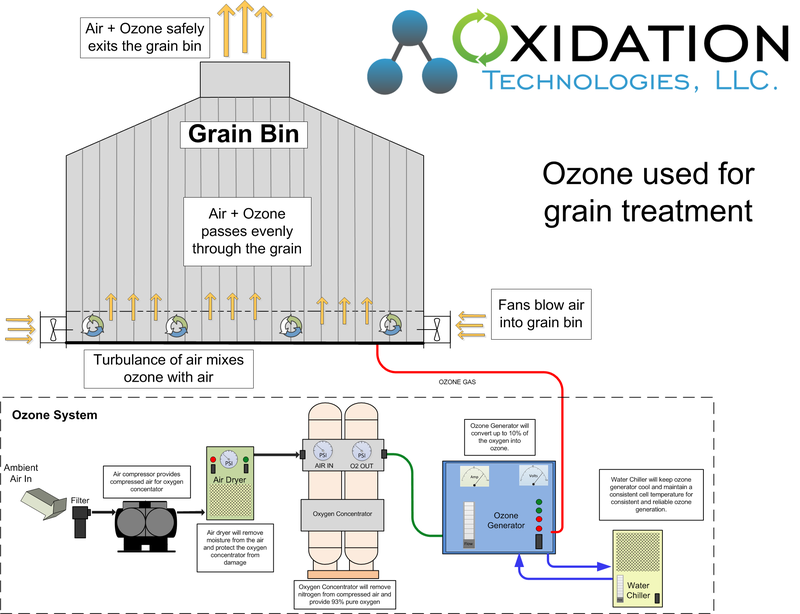 Should you have questions about any of these applications of ozone for grain treatment contact us today, we would be glad to discuss these and put our experience to work for you.